What’s left when everything is taken away from us – our tools, technology and libraries, even our homes, communities and citizenship? What’s remains is what we have learned by heart and we can do with our bodies: our voices, hands and feet. 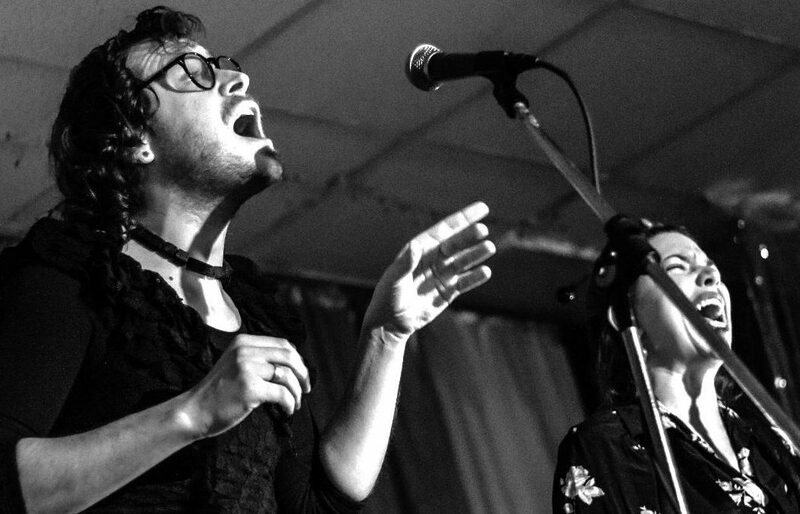 Using techniques from body percussion, tap dance, overtone singing and physical theatre, performance duo LUNATRAKTORS explore a set of British, Irish and Australian ballads to rediscover folk music as a queer space of personal and political transformation. Weaving the tragedy and comedy of these traditional tales with hypnotic acoustic percussion and harmonies, Lunatraktors create a genre-defying, “spellbinding” performance on the borders of music, theatre and live art. Combining the percussive and choreographic talents of ex-Stomp member Carli Jefferson with the four octave range and haunting overtones of trans folk singer Clair Le Couteur, Lunatraktors use the basic ingredients of body and voice to conjure up expansive, unexpected spaces. While the material is traditional, the themes of institutional violence, forced migration and personal hardship that echo through the songs are strikingly contemporary. The overall feel is of defiant, transnational protest laced with dark humour – an urgent political necessity in Brexit Britain. Debut album ‘This is Broken Folk’ will be released on May 18, 2019 (12” / CD / digital).